iderdider....: magical day. magic child. We caught snowflakes on our tongues and walked til our cheeks turned pink. We drank hot chocolate. This is your spot, Mama. Sit by me. A perfect day. I find myself missing her all of the time. His needs are more immediate. I find that my eyes well up when it's just her and me. 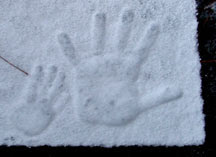 But today, in the snow, for a few moments, there was just one tiny hand to hold. We took the Mister out for about 2 seconds and he looked at us, like What are you fools doing? I am a BABY. Warm me up, punks. Oh, my eyes are welling up!! 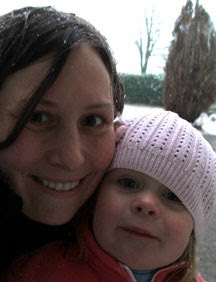 We had a wonderful snow day, too. The baby was sleeping in the house. Josh worked on an igloo while Makayla and I stomped around and just played. One on one time with the first is so special now!